In your dreams, Homer. And mine, too. I guess if I can brew in my driveway, anyone can right? 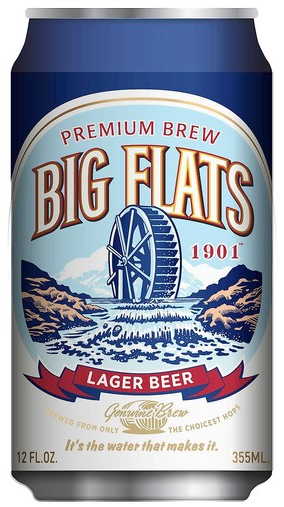 Well the folks over at Walgreens apparently have this can-do spirit when it comes to, er, spirits, as they are launching their own custom-brewed “premium” lager called Big Flats 1901. It should sell for about 50 cents a can. I’m not sure what makes this beer premium. It’s an adjunct lager, it’s cheap, and it’s contract brewed by Winery Exchange at a facility in Upstate New York. According to BeerAdvocate, this is the old Genesee brewery, where no good beer comes out alive. I haven’t tried this yet (I doubt I ever will) but the folks over at BeerAdvocate don’t seem too impressed. If Trader Joes can produce its own wine, then I guess Walgreens can make its own beer. I’m just glad they’re calling it “premium” and not “craft” – that’d be bad for the cause! I just wish they’d do it under the “Duff’s” brand. There’s a “premium” beer I’d grab for $2.99 a sixer! ← 2,4,6,8…Yep, Back at the Super 8. I guess that’s what makes TJ’s so special – they do stuff right. Ice Baby!! Yeah!! A sign of quality craftsmanship that can’t be overlooked. Can’t wait for the Wal*Mart beer – Desperation Falls Lager! I love the tag line: “It’s the water that makes it.” Beautifully ambiguous. Oh, and the waterwheel that is attached to nothing at all is a nice touch too! Or: “It’s the water that makes it potable.” Perhaps other commenters can weigh in with their own version? Good idea. But it’s not the water that makes it potable, it’s the fact that the nasties have been brewed out of it (hopefully!). Too funny as I was just going to start writing a piece about Walgreens starting to carry a line of wines…this just doubles the fun. Trader Joe’s wines, BTW, aren’t bad for their price point. Quaffable stuff, which I’m sure I can’t say for this beer. I wish I could say the same for their beers! Thanks for the, uh, great news? Anyway I’m just commenting to suggest that you correct the spelling of “apocalypse” in the title of the article. Good catch! Fixed it – thanks for the tip. Next time I go by a Walgreens I am going to get some and take one for the team. At least it won’t cost you much…except your SOUL!! I took one for the team last night. Indistinguishable from other macro lager. My buddy picked up a sixer for kicks and shared it with us. Yeah, watery. Sorry you had to do that Tex, but we appreciate you sacrificing your palate in the name of sharing!